Behind the discovery of the Holy Shrine lies an interesting story. Centuries ago Maa Parvati asked Shivji to let her know why and when he started wearing the beads of heads (Mund Mala), to which Bhole Shankar replied, “whenever you are born I add more heads to my bead”. Parvati said, “I die again and again, but you are Immortal. Please tell me the reason behind this”. Bhole Shankar (Shiva) replied that for this you will have to listen to the Amar Katha"Finally Lord Shiva decided to tell her the importance of divine story Amar Katha to Maa Parvati. He started for a lonely place where no living being could listen to the immortal secret and ultimately chose Amarnath Cave based in himalayas of kashmir. In the hush-hush, he left his Nandi (the Bull which He used to ride) in Pahalgam. At Chandanwari, he released Moon (Chand) from his hair (Jataon). At the banks of Lake Sheshnag, he released the snakes. He decided to leave his Son Ganesha at Mahagunas Parvat. At Panjtarni, Shivji left the Five Elements behind (Earth, Water, Air, Fire and Sky) which give birth to life and of which he is the Lord. After leaving behind all these, Bhole Shankar entered the Holy Amarnath Cave along with Parvati Maa and took his Samadhi. To ensure that no living being is able to hear the Immortal Tale, he created Kalagni and ordered him to spread fire to eliminate every living thing in and around the Holy Cave. After this he started narrating the secret of immortality to Maa Parvati. But as a matter of chance a pair of pigeons overhead the story and became immortal.Many pilgrims report seeing the pair of pigeons at the Holy Shrine even today and are amazed as to how these birds survive in such a cold and high altitude area. There is a two way to be at holy cave From Sonmarg and the other is from Pahalgam helicopter service are available from both sides. Arrival at airport meet and great by our representative, transfer sonmarg overnight at Sonmarg at Hotel Czara / Camp. Early morning transfer from Sonmarg to Baltal by car.Upon arrival at Baltal Depart for the Holy Amarnath cave by helicopter. Helicopters start operating at 6:00 a.m. (weather permitting) you will have approxiametly 1 hour for Darshan. Priority pass for Darshan is provided. 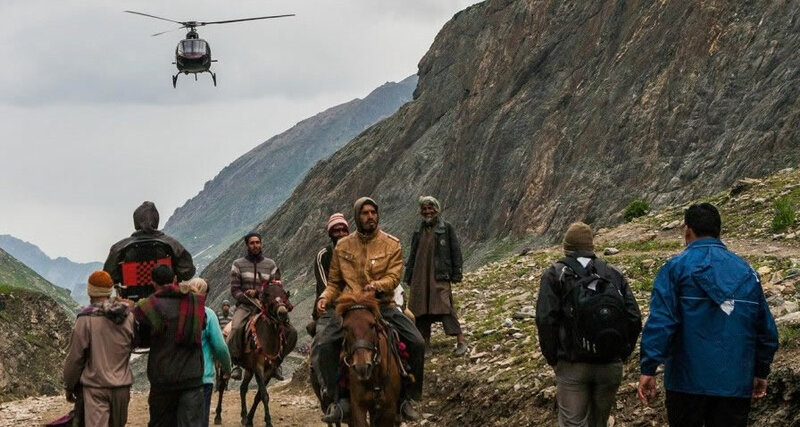 Return to Baltal via helicopter, you will then be met by our driver and transferred by jeep to Srinagar.On arrival at Srinagar check in at hotel, overnight stay in Srinagar Dinner and breakfeast included. After breakfast free time until transfer for airport. 1 Night Hotel /Camp Sonmarg. Accommodation confirmed as per package.